a) 1/4" thick aluminum plate for 12"x12" bottom plates and for the 6.5"x11" top plates. 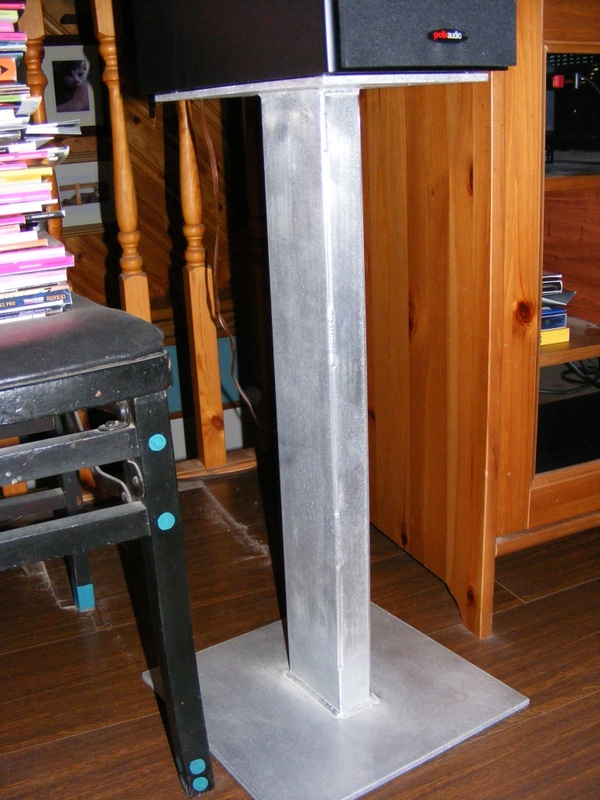 b) 2"x4" extruded aluminum angles to make a rectangular vertical tube for the risers. c) 1/4" thick, peel and stick high density rubber for the isolation pads on top of the speaker base plates and under the floor base plates. Kool nice work, where you going to leave them as they are or paint them? Fill the tubes up with sand or lead shot.. Very nice . I built a pair of stands from old planking which I removed from a house that I am redoing. Cost me only about three bucks for 3 cans of black spray paint. Very nice welding job, I agree fill the risers with sand or shot. When will you be taking orders? I have a set of RT55's that would be at home on those! Bedroom: Sony STR-DH820; CS400p; RT55p; Sony Grand Wega 55"
Nicely done. I would love to learn aluminum welding. I like the stands ! did the heat bend the plates at all ? Did you angle the top plate ? I wouldnt paint them maybe rattle can some satin clear coat on them .. I would consider bedlining them; gives them a textured finish with durability and grip. Great stands! I agree with the black anodized suggestion -- lloks great on aluminum. Nice industrial look and probably indestructible. Question to all the folks above. Now that the metal is "welded" just how would you fill it with sand or shot? Use a "transporter to beam the material inside? I have to agree with the sand filling thing! Rustoleum makes a very good product in different colors with different textures. I personally like their hammered texture in black. Just found this thread and had to resurrect it . I'm stoked 'cause this is exactly what I've been contemplating to use to make stands for my 7's. I can't weld to save my life but I have a friend who is an incredible aluminum welder, it's his profession. Just wanted to check to see if there was anymore information / conclusions about mass filling or finishing the aluminum. You definitely do not want rubber pads between the stand and floor. Spikes are the name of the game there.